In February of 1850, Taylor met with Southern leaders threatening secession who believed the Federal Government was overstepping its constitutional power and encroaching on their state rights. 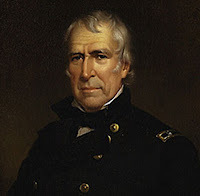 Taylor threatened back, telling them that persons "taken in rebellion against the Union would be hung... with less reluctance than he had deserters and spies in Mexico." A powerful way to get your point across. Unfortunately, before these mass lynchings of Americans could occur, Taylor died in office.